Maybe you have a folder full of JPEG images that you want to re-compress so that they aren't taking up so much room on your disk, or maybe you're delivering them over the web and you don't want to use up all of your bandwidth. If there are tens or hundreds of images, wouldn't it be great to automate the process? You can do this using Automator and Acorn! Open up the Automator application (it's located in your Applications folder), and make a new Workflow. 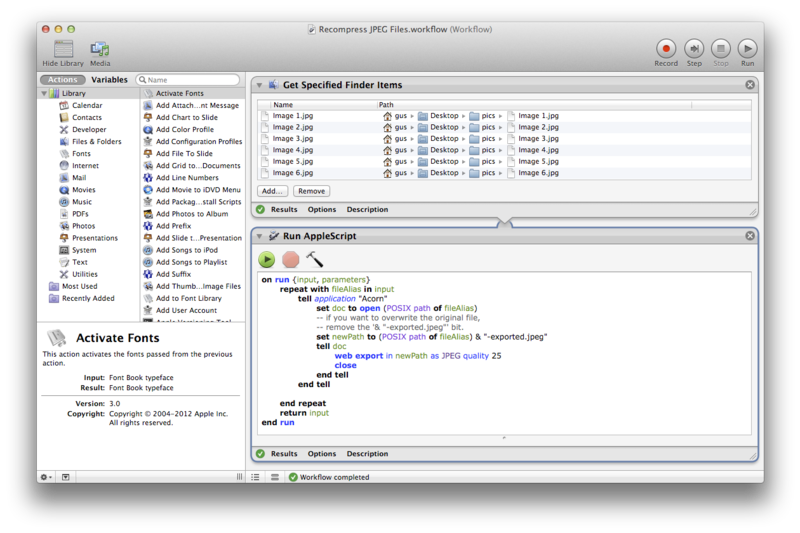 Next, add a "Get Specified Finder Items" action from the Library on the left of your Automator window. If you need help finding the action, you can quickly search for it in the search field. Use the Add… button on the Finder action to select your images. You can also drag and drop them all into the table. -- remove the '& "-exported.jpeg"' bit. set newPath to (POSIX path of fileAlias) & "-exported.jpeg"
And your images will be written into the same folder as the originals, with "-exported.jpeg" appended to the end of the name.